I have not hunted a lot of Oldsquaw over the years. Nevertheless I always welcome the chance to see and hear these cold weather ducks. 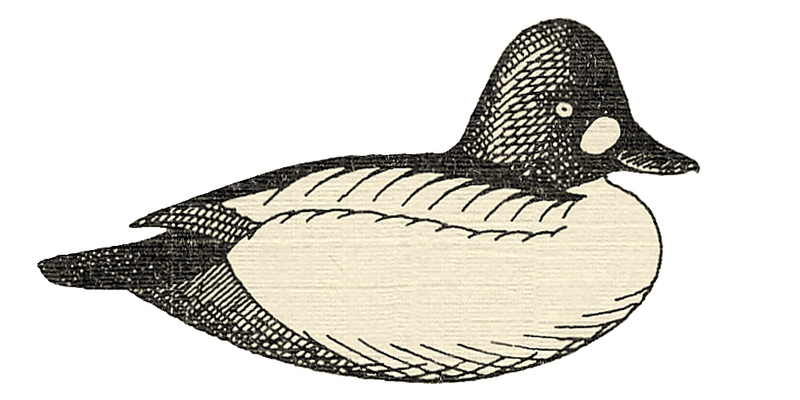 As with most ducks, my earliest memories are from the birds my Dad would bring home from Great South Bay in the 1950s. He did not pursue Oldsquaw in particular. Rather, they were an occasional bonus when he would be gunning Broadbill from his Great South Bay Ice Scooter. In his experience – and later my own – Oldsquaw would visit the rig when there was lots of ice around – and especially if one were rigged in an “airhole” in an otherwise frozen Bay. The Oldsquaw below were a pleasant surprise. It is unusual to find this species anywhere near shore. These 2 birds were in a boat basin. I was able to photograph them from my car, parked so that the light was behind me and shining on them. One is an obvious adult Drake – but I believe the other is a young-of-the-year bird and not an adult Hen. The greyish back feathers – with little brown or reddish – tell me it is not a fully mature female. These decoys are from the Homer Decoy Company in Piqua, Ohio. A foam bird with a truly durable hard plastic head, these decoys are a nice complement to the old Herter’s Model 72 diver decoys that many of us grew up with – and still gun over. I just learned, though, that Homer is now offering a “magnum” Oldsquaw – built on the same body as their Eiders. Either way, my approach to painting them would be the same. As I do with most of my foam decoys, I put a tough skin on these Oldsquaw. These got my first experimentation with ground walnut shells (from Harbor Freight). I fastened the heads with stainless steel screw eyes – with the heads set in a paintable silicon caulk. Before doing so, I sanded each head with 100-grit and then wiped it with lacquer thinner. I used the Fine grade particles and sprinkled them onto birds that had been painted with marine epoxy ( U S Composites 3:1, Medium Cure laminating epoxy) thickened with Cabosil. After the epoxy cured, I coated them with an oil-based primer – and hung them up to dry. As usual, my topcoats are latex paint. I use sample jars of Behr paints from Home Depot (although I buy full quarts of certain colors that I use on lots of different species). I use a variety of brushes – the general rule being to use the largest brush you can for any painting task. I used a pair of foamers – the first I ever carved – as the models for the paint. And, I identified the 12 Drakes with pink bills and 6 Hens with blue-grey bills. I mixed a little WHITE into some OXBLOOD (Behr PPU 2-20) to make the pink – because I have the OXBLOOD on hand for Drake Mallards. You could get close with WHITE + MOROCCAN HENNA (Behr PPU 3-19). Similarly, instead of the DARK STORM CLOUDS (Behr 740-F4), you could just mix a little FLAT BLACK into some FLAT WHITE – to get a cool grey. 1 ~ Paint White onto head and upper chest. 2 ~ Bring the White well below the neck seam. 3 ~ Paint the upper halves of each side pocket White. 4 – The White goes on the whole tail section except for the central tail feathers. 5 ~ the undertail section is completely White. 6 – Bring the warm grey ELEPHANT SKIN up on the sides – but leave a White upper portion. 7 ~ Most of the back gets the ELEPHANT SKIN, too. 8 ~ I used the ELEPHANT SKIN on the face – but MOCHA LATTE is a better color – same as a BLACK DUCK face. 9 ~ The Black is at both ends of the bill. 10 ~ Here is the top view. 11 ~The eye is MOROCCAN HENNA. 12 ~ The lower portion of the cheek patch also gets the MOROCCAN HENNA. 13 ~ The speculum is the reddish-brown, too. 15 ~ The dark brown ESPRESSO BEANS finishes the cheek patches. 16 ~ The pupil is Black – to finish the head..
17 ~ The ESPRESSO BEANS on the back follows a complex pattern. 18 ~ Here is the chest. 19 ~ Bring the ESPRESSO BEANS back on the sides at a rearward angle. 20 ~ Here are the wing details. 21 ~ Drape the long Tertial feathers backward over the speculum and almost onto the tail. 22 ~ Paint the few tertials with a paler grey – I use GRACEFUL GRAY but you can just add White to the Elephant Skin. 23 ~ The Tertial edges trimmed with White will make them “pop”. 24 ~ Finally, delineate the edge of the side pocket with White. 1 ~ As with the Drake, WHITE goes on the head and upper chest. 2 ~ I keep the dark crest unpainted. 4 ~ the WHITE covers the entire tail section. 6 ~ Underside of tail. 7 ~ MOROCCAN HENNA eye and its BLACK pupil. 8 ~ BLACK on both ends of the bill – like the Drake. 9 ~ ESPRESSO BEANS starts on the crown. 10 ~ The cheek patch shape varies greatly. 11 ~ Just the upper “ring” of the chest is dark brown. !3 ~ and then onto the entire back. 14 ~ Here is the finished tail. 15 ~ The upper edges of the sides stay WHITE. 16 ~ The MORROCAN HENNA blends softly downward on the chest. 17 ~ MORROCAN HENNA suggests some feather edging on the back. 18 ~ Last step: Curve WHITE downward to suggest scalloped sides.